Hellp peeps, here with the list of winners for February, some wonderful entries again and our thanks for all your creativity which is a joy to see. Hi folks, in case the news passed you by, the new 2011 Spring release stamps were revealed at CHA last week and are all available to view here. As usual Penny Black have not disappointed and there is a fabulous array of new designs so do check them out, I just know you will have lots of 'must haves', I know I do........no surprise there then ! They are shipping to your local stockist right now, so why not get ahead of the game and place your order so you are at the top of the queue. And don't forget you can join the Penny Black Club here and you can even share your work with other Penny Black lovers at the Penny Black Circle as well as join in their competitions and win some super prizes. It's lovely to see so many of you joining in this months challenge and as usual some really great artwork and of course there are lots of prizes up for grabs including the mystery prize for one of this months new followers of our blog. All details in the post below. Just about anything goes here as long as we can see a flower or two and of course a Penny Black stamp or Stickeroo as your main image. On that point, we have noticed a few creeping in with no Penny Black image so please make sure your entry fits the rules........after all we are not called Penny Black at Allsorts for nothing........... and who can resist their stamps anyhow ? We always try to leave a note for any who do not use a PB image but this takes the DT a lot of time when they could be visiting other blogs, so in future we will just add a note alongside the name on Mr Linky. And a note about the closing date for this challenge, as it's February and a short month, the last time for entering will be Midnight GMT on 24th of the month, when Mr Linky will close. January was a great month for us, we have lots of new followers and so many of you joined in our Blog Hop which was great fun, thanks to everyone for making it all such a success. 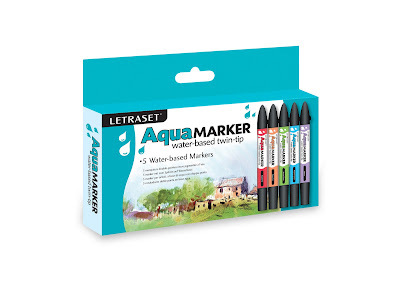 .............Letraset who are offering a set of Aquamarkers to one lucky winner. AquaMarkers are a dual tipped water based, pigmented ink marker with the advantage of being water soluble. They can be easily blended, even when dried, giving the effects of water-colour paint but with the convenience of a marker. The water colour quality of the markers makes an ideal accompaniment to an artist's tool box, providing a clean and convenient alternative to water colour paints. PB stamps who are offering a lifetime 15% discount for products purchased from their store, it you have never visited them you don't know what you are missing.................new stamps, old stamps and even discontinued stamps.